Polyculture of prawn with carps makes the ecological balance of the pond water, preventing the formation of massive algae blooms (Cohen et al. 1983) and at the same time increase the total production. 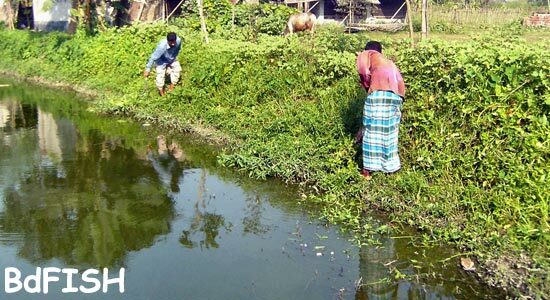 Prawn polyculture with carps in ponds is a recent practice in northern region. Aquatic weeds were removed manually. Predatory fish and unwanted species were removed through repeated netting. All the ponds were fertilized with cow dung (2000 kg/ha), urea (50 kg/ha) and TSP (50 kg/ha) as a basal dose after 7 days of liming (250 kg/ha). Bamboo sticks, bamboo and plum leaves were also used in ponds for shelter of prawn. 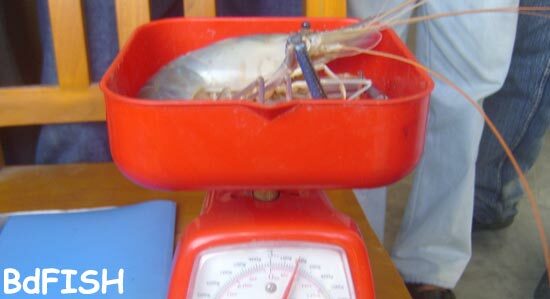 The initial weight of prawn (Macrobrachium rosenbergii), silver carp (Hypophthalmicthys molitrix) and catla (Catla catla) were 2g, 60 g and 50 g respectively. 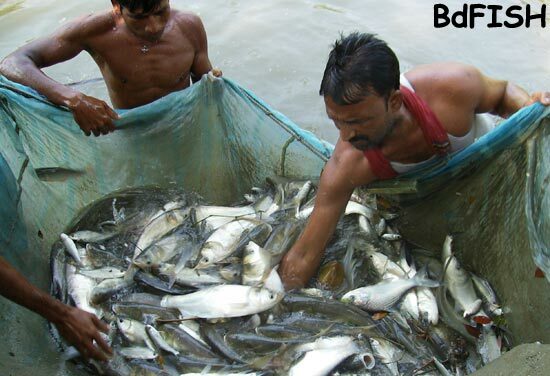 Stocking density of prawn, silver carp and catla were 15000, 3000 and 2000 individuals/ha respectively. Prawn were fed twice daily at the rate of 10% body weight at the first two months and it was reduced to 4% at the 3rd month and 2% at the last three months. 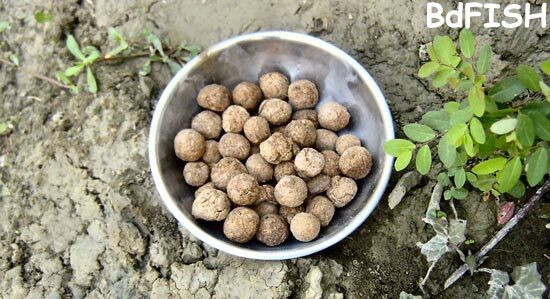 Two types of supplementary feed were used such as: Rice bran 100% and Rice bran 20%, Fishmeal 30%, Oil cake 50%. Feeds were applied into the ponds twice daily. 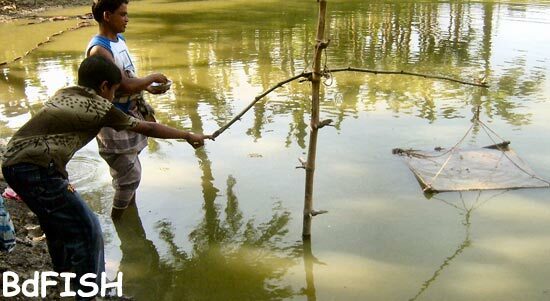 In each month 10% of the stocked prawn as well as fishes were caught from each pond with the help of a seine net for the study of growth performance of fishes. Temperature varied from 21.84 to 22.07º C. Ling 1969 recommended that a temperature ranging from 22 to 32º C is suitable for prawn culture. In the present study the temperature was lower than reported by Ling (1969) particularly during the winter months. Water transparency varied from 24.50 to 30.37 cm. Boyd (1982) reported a transparency between 25 to 40 cm as appropriate for fish culture. The mean pH in the ponds was 7.51 to 7.54. Hossain et al. (2000) found the pH range varied from 6.8 to 8.1, which fall within the suitable range reported for farming of M. rosenbergii. The mean values of Dissolved oxygen varied from 2.83 to 3.35 mg/l. Wahab et al. (1995) recorded DO ranging from 2.2 to 7.1 mg/l in fish culture pond. Ammonia-nitrogen value ranged from 0.0183 to 0.0274 mg/l. The present findings more or less agreed with BAFRU (1990) reporting NH3-N of <0.025 mg/l as safe for fish. The mean value of alkalinity varied from 95.00 to 137.25 mg/l respectively. This findings strongly agreed with Boyd (1998) who reported natural fertility of pond water increases with increase the total alkalinity up to at least 150 mg/l. The production of prawn varied from 797.91 to 1088.84 kg/ha. Mazid et al. (1989) reported the production of prawn of 265 to 790.60 kg/ha. The production of silver carp and catla varied from 1414.22±72.12 to 1542.37±41.10 kg/ha and 426.44±55.45 to 597.09±29.93 kg/ha, respectively. The total production of prawn and fish in the present study which ranged from 2638.58 to 3228.31 kg/ha/6 months. The results of this findings indicated that production of prawn, silver carp and catla were higher in Rice bran 20%, fishmeal 30%, oilcake 50% than that of Rice bran 100%. BAFRU, 1990. Water quality management for Aquaculture and Fisheries. Institute of Aquaculture, University of Stirling, UK. P. 49. Boyd, C. E. 1982. Water quality management for pond fish culture. Elsevier Science Publishers, Amsterdam, The Netherlands. p.318. Boyd, C. E. 1998. Water quality for fish pond. Aquaculture Research and Development series no. 43. Auburn University, Alabama, USA. p. 37. Hossain, M. A., Siddique, M. A. I. and Maije, M. A. H. 2000. Development of low cost feed for culture of giant freshwater prawn (Macrobrachium rosenbergii de Man) in ponds. Bangladesh Journal of Fisheries Research. 4: 127-134. Ling, S. W., 1969. Methods of rearing and culturing Machrobrachium rosenbergii. FAO Fish. Rep. 57, pp. 589-606. Mazid, M. A., Miah, M. J. U. Y. and Ahmed, S. U. 1989. Effect of different stocking density on the growth and survival of Macrobrachium rosenbergii with supplemental feed. Bangladesh J. Fish. 14(1): (in press). Wahab, M. A.; Ahmed, Z. F.; Islam, A. and Ramatullah, S. M. 1995. Effect of introduction of common carp, Cyprinus carpio (L.) on the pond ecology and growth of fish in polyculture. Aquacult. Res., 26: 619-628. Visited 1,629 times, 2 visits today | Have any fisheries relevant question?